Orgeon Looking To Require Doctors Prescription For Cigarettes, Is There An Idiot Doctor In The House? Rep. Mitch Greenlick, from Portland, is sponsoring a bill that makes cigarettes a Schedule III controlled substance, meaning it would be illegal to possess or distribute cigarettes without a doctor’s prescription. Under the proposal, offenders would face maximum punishments of one year in prison, a $6,250 fine or both. Oregon voting on requirement for doctors to prescribe cigarettes. 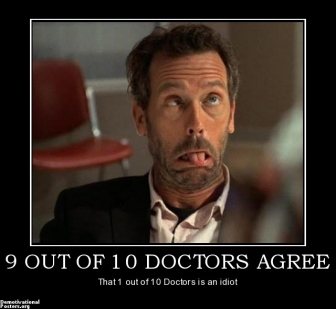 Is there an idiot doctor in the house? This entry was posted on January 25, 2013 at 6:24 am and is filed under Uncategorized. You can follow any responses to this entry through the RSS 2.0 feed. You can leave a response, or trackback from your own site.